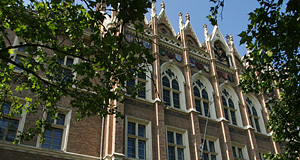 The Akademisches Gymnasium is a secondary school in Vienna that can be found near the Ringstraße, in a neo-Gothic building between Schwarzenbergplatz and the Stadtpark. It was founded in 1553, and is the oldest secondary school of Vienna. There are approximately 600 students that are divided into 24 classes - the system in Austria is such that a group of approximately 25 children at the same age form one class which than attends school in a singe room where the different teachers go. Often teachers accompany a class over a period of several years - sometimes the entire eight years of their school education from entering the Gymnasium to their final examination, the Matura. The Akademisches Gymnasium is a public school and thus, free of charge; of the public schools in Vienna, it is probably the most highly-regarded. The Akademisches Gymnasium was founded by the Jesuits, who had a keen interest in educational matters. The original prospect of the school was to teach religious subjects only. The first school building was situated between the Jesuite monastery and the Dominican Church in the first district of Vienna. When the Jesuites were dissolved under the rule of Emperor Joseph II, the Akademisches Gymnasium gained a new direction: Instead of religious subjects, the focus was put on history, maths, German and literature and geography. Similar to many schools, the maintenance of the Akademisches Gymnasium was transferred to the Piarist Order (see also my article on the Theresianum - or the Piaristenkirche in the Josefstadt). The revolution of 1848 led to the next set of drastic reforms: The formalised Matura exam after eight years of education was developed. In 1866, the Akademisches Gymnasium moved from the first district to its current venue on Beethovenplatz Square. The neo-Gothic school building is moderately attractive, at least in my humble opinion. It was designed by the architect Friedrich von Schmidt, who was also responsible for the Rathaus City Hall. The first female students graduated in 1886 with special permissions. The regular opening of the Akademisches Gymnasium for female students happened in 1949. The Gründerzeit period and the age of the Vienna Modernism was certainly the bloom of the Akademisches Gymnasium - benefiting from the wealthy, liberal burghers and their interest in educational matters. The years after WWI and the collapse of the Empire led to a drastic decrease in student numbers. With the Anschluss in 1938, the many Jewish students and teachers were forced to leave the Akademisches Gymnasium - this included the grandfather of the Australian philosopher Peter Singer, as he described in a book called "Passing Time Away", but also the later Nobel-laureate Walter Kohn. Today, there are memorial plates at the entrance of the Akademisches Gymnasium that commemorate the people who were forced out of the school by the Nazis. It affected approximately 50 percent of all students, since the Akademisches Gymnasium had a reputation for being liberal and Jewish. After WWII, the school gradually built up its stand in Vienna again; similar to the Wiener Moderne, the golden days of the Empire did not come back, but with is seemingly old-fashioned focus on humanities and ancient languages, the Akademisches Gymnasium has a sharp profile and a lot of recognition in Vienna. Famous students of the Akademisches Gymnasium include Franz Schubert, Erwin Schrödinger, Arthur Schnitzler, Erwin Ringel, Ludwig von Mises, Johann Nestroy, Walter Kohn, Hugo von Hoffmannsthal and Peter Altenberg. Attractions nearby include the Stadtpark, the Konzerthaus and Akademietheater Theatre, Schloss Belvedere Palace, Palais Schwarzenberg and the attractions of the Karlsplatz.